Fairly obvious why it is restricted, its a great mix of icons and the random resourcing hurts. Could be nice to combine with The Blackwood Initiative. Good icons/skill/toughness for the cost plus the ancient one subtype for extra protection. The real reason to include him is the ability, which can really mess up your opponent's plans if he is playing multi faction. Now with added agency synergy thanks to their new resource control cards. Quick question: Does the owner of Nyarlahotep get to choose which domain will be resourced? I think that's what the card says but I want to make sure. Yes, due to the last sentence. He changes only how the card is determined which will be attached. 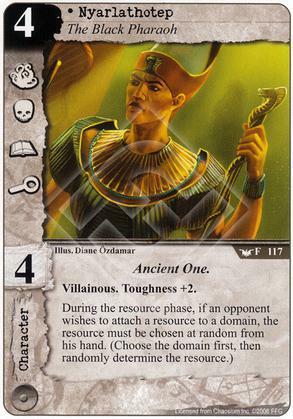 I'm sure there are more ways to build around Nyarlathotep, the Black Pharaoh. These are just 3 that I've noticed.